It’s not difficult to set up classes that allow you to learn in the comfort of your own surroundings. Why not learn to play the harp for your own wellbeing and relaxation? There is nothing like the sound of the harp to des-stress you. Why not treat yourself? A whole new world awaits! Check with Madeleine for tuition rates. 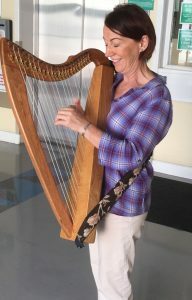 One of the many benefits of the internet is being able to offer online harp tuition. And my students come from a variety of places: UK, USA, mainland Europe. A couple of my students were not very familiar with the internet prior to starting their new classes but the impetus of having the luxury of learning in the comfort of their own homes, encouraged them develop their internet skills.